While the benefits of our banjos have been presented in a variety of ways over the years, there are still those who are not aware. Some players are inspired to purchase a new instrument because of the beautiful sound that it makes. Others are motivated by popularity of certain brands. A decision to purchase the best banjo involves more than its sound or its current popularity. 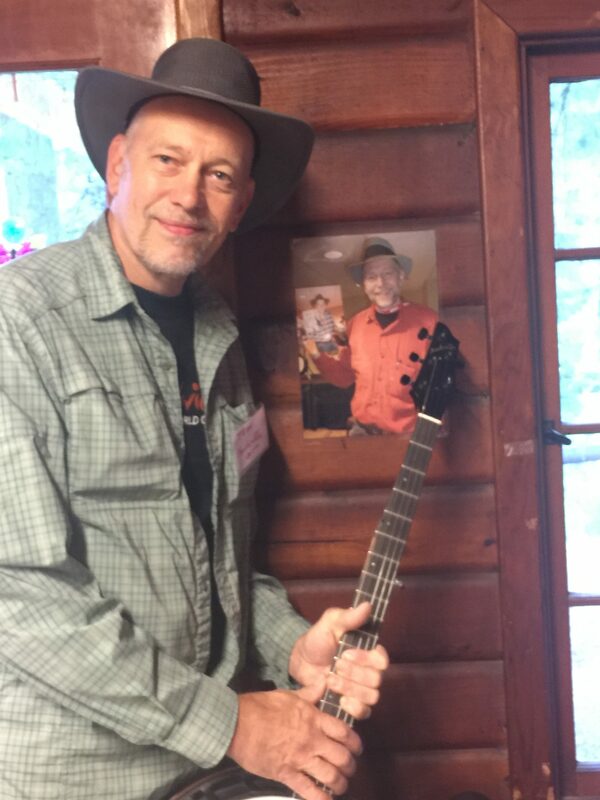 In today’s banjo marketplace, there is one essential decision to ponder. Yet unfortunately, the vast majority of banjo buyers do not even know that this choice exists. If you were to purchase an adding machine without knowledge of a calculator, or a typewriter without knowledge of a printer and computer, you would not be happy when you discovered the new way of doing things. It is our challenge to inform those of you banjo lovers what you have been missing for quite a few years now. As a player, can you imagine a dream world where your sound is refined, your notes are articulate, distinct and yet full and saturated with tone? Maybe you play different styles of banjo and have several instruments set up accordingly. In our dream world, your perfect banjo can quickly adapt to different player preferences and will disassemble for easy transport and travel. You may never have asked for your banjo to be constructed differently; to have one tone-harnessing helical thread that perfectly nests your tone chamber for perfect resonance. Your dream tone is even on every fret with your head automatically tightened perfectly evenly. Set up is no longer a hassle. It becomes fun to modify your playing options and resulting sound. We made this dream a reality. 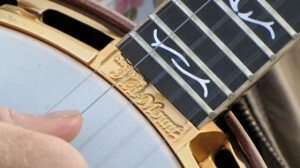 Were you aware that there are 60-80 fewer parts required in a Nechville banjo? The construction is permanent and foolproof. Whatever sound your traditional banjo makes, it does so with its tone bell and mounting rim firmly fixed to the neck with metal hardware. Additionally you have dozens of hooks and nuts, lugs, hoops and other metal parts attached to the body that we would like to refer to as the “Tone Chamber”. What tone do you get from the tone ring and rim that is attached to all those metal parts? It is no surprise why the banjo is often called “tinny” , “brash” or “metallic”. Did you know that Nechville makes a banjo whose neck is attached to a one-piece hardware frame that holds your tone chamber without any interference from metal connections at all? Were you aware that there is only a single thread that presses the tone chamber up from behind to deliver you a palate of sound from dark and warm to excitingly brilliant? If you have not been aware of these things, you are now. We invite you to become a member of the family of Nechville players by simply contacting us or inquiring with one of our dealers. We wish to assist you in finding the ultimate instrument for a lifetime of enjoyment. Visit us at www.nechville.com to learn more. Or better yet, give us a call. Making music is a great hobby. It’s a fun and creative outlet, It can be expensive if you collect expensive instruments. But compared to Cable TV, Golf, Boating, skiing, and driving, hunting, raising pets, or sky diving, it’s cheap. Especially if you are wise and purchase good instruments with high resale value. One of the best things you can do for yourself is to buy the best instrument you can afford. I know many people who have wasted money on banjos that looked good, and even sounded pretty good for a while. Then the instrument starts needing continual adjustment, and unfortunately never delivers top-tier performance. Then people lose money on a trade for a slightly better instrument which still doesn’t measure up over time. Even after a player has lost money several times over on inferior banjos and settled on one he thought would be his last, invariably a picky player’s ear begins to seek alternate sounds. Please don’t just go out and buy a banjo just because somebody said it was the best. Make your best choice by learning what really makes a banjo great. Here’s a practical checklist for those of you looking. The following is a list ofthings that I find important as a player and a builder. 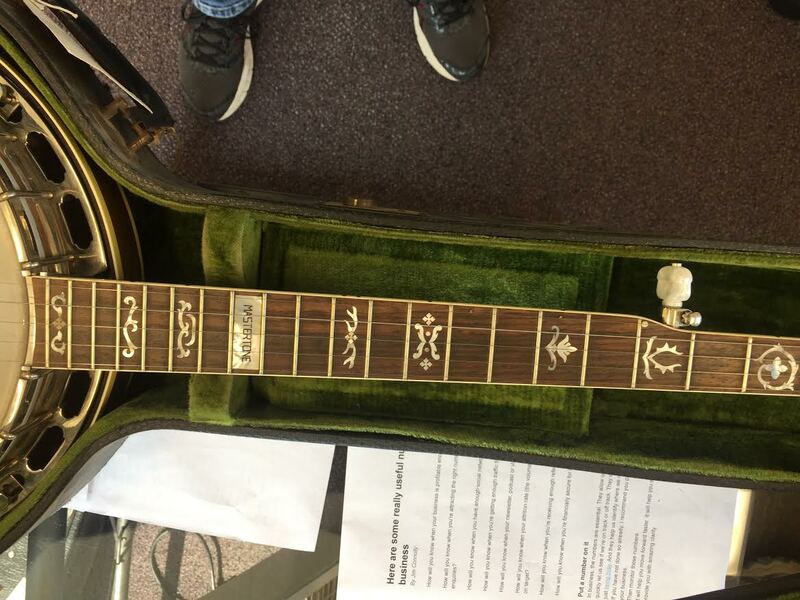 You’ll have your own priorities however, like how it sounds and looks, but the following are banjo luthiers’ details that may not be obvious to you but are worth considering when looking for a banjo. The Nechville Helimount acoustic banjo is a breeze to set up and adjust to your liking, but I recently realized that there is a great need for more precise instructions for the more advanced players and those with very specific tone ideas in mind. 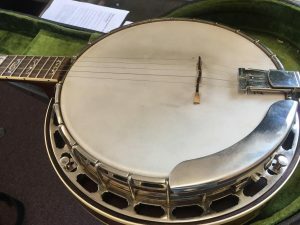 When I am working in person, I always help people understand their banjo a little better, but I can’t do that with everybody, so here is my best shot at walking you through all the set up steps and adjustments that you can do on a Nechville banjo. Let’s start with by making sure the head is set for the right sound and playability. Like any part of a banjo, The type of head is an important set-up choice. Something to think about before changing heads is what will the head do to the level of the playing surface of your head? For example, If you are going for the warmer sound of a relaxed head, you’ll benefit from using a high crown head, especially if you prefer to use a smaller bridge. The high crown allows the tone ring to push the head up higher in relation to the tension hoop so you can use a shorter bridge. If you go too tight with the high crown, the playing surface might get as high as the top of the tension hoop, which is not recommended. 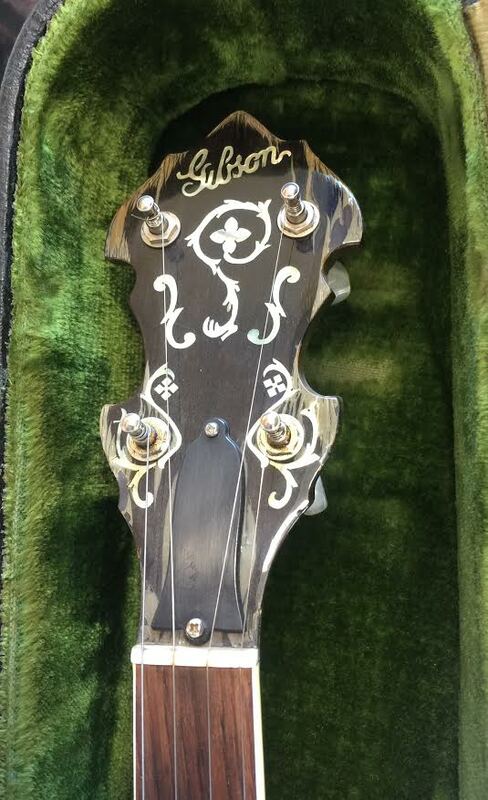 Please don’t use low crown heads in a Helimount, unless you use it with an archtop tone ring. The low crown with a flat head tone ring may not give you enough room to thoroughly engage the thread of the flange ring with the thread of the Helimount, and it could become cross threaded. When replacing heads, always spin the flange ring in by hand and be sure it is level and nothing is preventing full mating of the threads. I would also avoid certain specialty heads like Kevlar, and thick reflective heads: they usually don’t sound right, and their stiffness makes them difficult to use for the same reason as the low crown, unless they have been previously stretched out in another banjo. 5 Star and Lugwig white frosted on top plastic heads will work, but you’ll find the sound bright but one dimensional. I prefer the Remo standard heads for a bit more depth and full ranging response. The Renaissance translucent heads give a more organic or warm effect. Continue tightening your head to playing tension, place the bridge and tune it up. Once you think the head is tight enough, Check the neck bow. Hold down a tightened string at both ends of the fingerboard, and there should be a small distance from that string to the middle frets. I mean less than .01 or 1/100 of an inch of bow. That’s only a thick sheet of paper. A 1/4″ nut driver is the tool of choice for adjusting the truss rod. Be sure you have one that is small enough to fit into the access hole on the peghead, (call Nechville if you need one). With the proper neck Bow and tight head, now it’s time to install your favorite height bridge and check the action (my favorite is a 3/4″ radiused bridge). If you are satisfied with the action after reaching this step, great , it is time to skip to the next paragraph below. If however the action is too low, you have a choice. Either install a higher bridge, tighten the head more, move the neck up to decrease neck angle, or do any combination of these 3 things to arrive at the best action. Consider how each adjustment affects the overall tone and whether it will take you closer or farther from your goal. When I mention these effects, note that the converse is also true (go the other way to remedy high action). Taller bridge usually means more mass, increasing sustain, raising action, and giving the banjo the capability of being played with more volume, as long as the mass of the bridge is not muting too much. Keep the bridge under 3 grams and you should be OK. It is great to have an assortment of bridges, especially if you have several banjos. 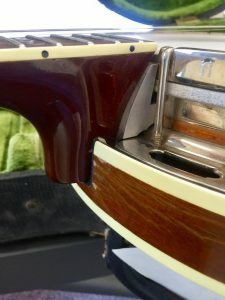 Changing bridges at this point in the set up process is a good idea, because you can learn more about what size and weight bridge your banjo likes with the particular head tension and neck angle that you are starting out at. Tighter Head means higher action, brighter and louder sound to a point, and generally a more focused and stable sound. If head barely yields to finger pressure, and reads over 92 on the drum dial, it might be too tight, in which case the bass response and body sound of the instrument can be lacking.Neck Angle is adjustable via the set screw on the bottom of the Heel. Loosening this screw loosens the neck, and the strings’ tension will pull the action higher. Retighten the set screw firmly when you reach the proper action. Note, lowering action is best done with strings loosened, and the banjo placed face down in your lap while seated. You may need to re-lower and re-raise the neck angle a couple times to arrive at the perfect action. Be sure Allen screw is all the way tight and neck will not move when twisted. Now that you have the head and action at playable levels, how does it sound? Perhaps it isperfect, but the point of this article is that as a picky player, you, like me will not be satisfied with perfect. We want special, magic, extraordinary. This lofty aspiration is what keeps my interest and is my continual aim. My builders are fantastic craftsmen who produce perfectly set up works of art. Part of my job is to give each banjo a personality of its own. It is not an easy thing to teach, because every instrument is different and it is hard to predict what might make the instrument come alive. The following is a list of ideas, not a sequence asset out previously, but are optional techniques mentioned here for discovery. The fun of this is that there is still room for surprises, Most of the adjustments I do have predictable results, But there are still times when I am surprised at how certain combinations of set up factors react. Are you looking for a gut rattling bass? Maybe the answer lies in finding the right bridge. conventional thinking would dictate a heavier bridge for enhanced bass, but maybe your ear is longing to hear the bright side of the banjo’s lower register. Perhaps a well crafted lighter bridge with a looser head would do the trick. Do you want the overtones to enhance the experience of playing, not detract from it? Try moving the tailpiece forward and back, making the distance from the end of the tailpiece to the bridge different. Try Playing the strings on the wrong side of the bridge. Are they tuned to a common interval of the open string? I like the interval to match the second harmonic, or the 5th note of that string’s scale, but tuning it to other notes is possible with a Nechville tailpiece. First use thesmallest Allen wrench and back out the small setscrews until the tailpiece almost touches the frame. You’ll also have to loosen the lower set screw, but you can re tighten the lower set screw later if you want the strings to have the highest break angle over the bridge and add extra down pressure on the tailpiece. At this point, the tone should be sharp and snappy, but perhaps not full bodied enough for your liking. Now try exactly the opposite. Loosen the strings and tighten the small top tailpiece set screws. This moves the tailpiece back, decreases Break angle and lowersthe pitch of the sympathetic notes behind the tailpiece. As you move the tailpiece in and out, monitor the notes you hear when plucking behind the bridge. Try it with the larger bottom set screw barely snug, and have a friend help you monitor the sound as one of you tightens it. A piece of leather or felt between the strings behind the bridge would mute some of the high sympathetic vibration, perhaps yielding a “drier” tone. Do you want the strings to jump to life with a mere touch? Try a Renaissance Head, and tighten it up a lot. Use a relatively light, but tall bridge, ie, 3/4″ 2.3 gram and moderate, (not too low) string action. Let the tailpiece tension off except for only slight down pressure. Then go aheadand try the down pressure by tightening the large Allen screw on the tailpiece, Try to find where you like it best. Are you seeking easy, fast and clean playability ? That requires perfect fret level and perfect neck bow and perfectly shaped bridge. Given that there is an ideal neck bow shape, (not straight, but with perhaps .008 ” of bow) there is an optimum height for each string from the fingerboard as defined by the bridge’s shape. 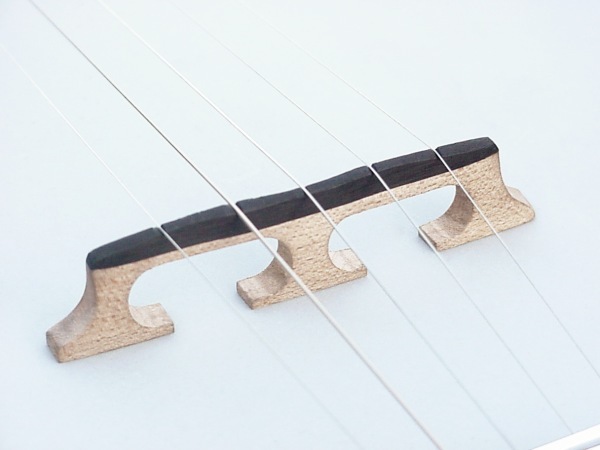 Of course with a radiused fingerboard, The bridge will need to have a similar shape, but too often people ignore the importance of the proper action of individual strings. The heaviest strings tend to get struck hard by the thumb, and so the 3rd and 4th strings need a bit more room to vibrate without hitting the frets. This means making the bridge higher in the middle than may be simply dictated by the neck’s radius. On a flat board, this would mean that a slightly radiused bridge would work better, allowing lower action on your 1st, second and 5th strings. However if you simply radius your bridge, you will be compounding the problem thatis already so common in banjos, and that is the 3rd string being sharp up on the higher frets. Make sure the 3rd string especially is compensated with a longer scale, and particularly if you have followed my advice and radiused the bridge more than the curve of the frets. The amount of compensation needed varies whether the bridge is sagging or higher on the 3rd string, but with the medium strings I use, (10,12,14,22,10), and a healthy radius, the 3rd string is set back about .080 from the other strings. Do you want a banjo with perfect rich tone? Call Nechville for an assortment of heavy bridges. We will sell you several Enterprise bridges at a discounted price if you want to buy 3 or more. Start with a big bridge, and you can play with it by cutting deeper slots, and taking more ebony off the top. That will lower strings and perhaps change the harmonic content of the tone. You can spend time rounding the corners of your bridge, and thereby reducing the weight a little. 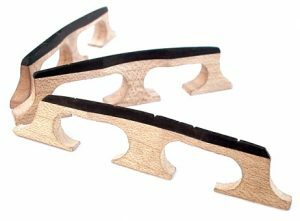 Most of my best sounding banjos have bridges weighing between 2.4 and 2.8 grams. The type of head and head tension are huge factors in controlling sound. A heavier, frosted head like a 5 star head tends to dry up the sound for less ringing and sustain. I have noticed the clear heads and black heads do have a bit of ringiness. When adjusting or installing a head, monitor how it sounds after every few twists of the Helimount wrenches. You might find a special tension that works even if it’s looser, but it is probable that you’d need to also raise action for play at looser head tension. 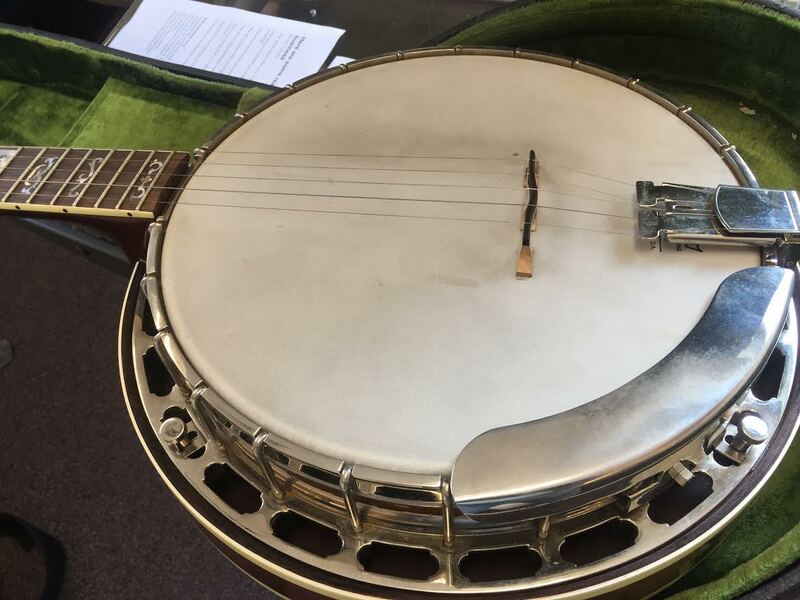 Once you find an ideal head tension for your banjo, mark the turning flange ring inside the banjo with a small piece of tape near the middle of the neck, And you will be able to return to that exact spot any time you choose. Your ideal tone may be different than mine, but given the ease of adjustment and armed with a little knowledge as to how to go about it, you will be ready to meet your next musical adventure.